For over 25 years An Introduction to Social Psychology has been combining traditional academic rigor with a contemporary level of cohesion, accessibility, pedagogy and instructor support to provide a definitive guide to the engaging and ever-evolving field of social psychology. 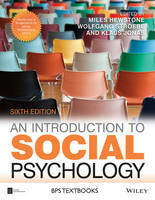 This sixth edition, completely revised and updated to reflect current issues and underlying theory in the field, has been specially designed to meet the needs of students at all levels, with contributions written by leading psychologists, each an acknowledged expert in the topics covered in a given chapter. The text benefits hugely from an updated range of innovative pedagogical features intended to catch the imagination, combined with a rigorous editorial approach, which results in a cohesive and uniform style accessible to all. Each chapter addresses both major themes and key studies, showing how the relevant field of research has developed over time and linking classic and contemporary perspectives.